Since this page is new for my projects on iGoogle HomePage gadgetry, right now I’ll show here my first gadget, in the future, I’ll be releasing new gadgets and information about existing ones. 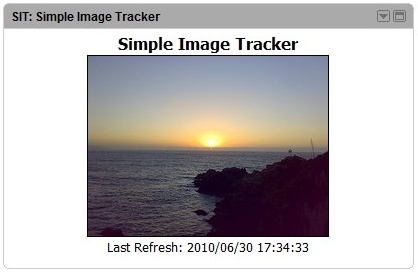 This iGoogle Gadget is intended to show an image from a given URL in your iGoogle HomePage. Very useful if you want to track realtime graphs (ex. currency rates) from just one look at your iGoogle HomePage. Image width: self explanatory… you can shrink or expand as you want. Image height: same as Image width. Time to refresh: time in minutes in wich the image will be reloaded. The timer starts when you first view the content of the gadget. Show border? : wheter show or not an image border. Show title? : wheter show or not the title inside the gadget. Show date? : wheter show or not your local date and time when you first load the gadget. Usefull when you want to know when the gadget will reloaded. DANIEL, estive googleando el santoral del dia y al final llegué a tu página…. ja, ja!!!! TE FELICITO. Soy el admirador numero uno de los CONTENIDOS que generas.